The Iowa Caucuses are coming, and the 2012 election is well underway. 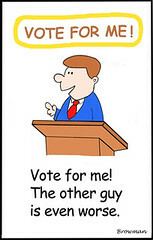 Soon our country will be awash in political advertising. Maybe awash is the wrong word, maybe flushed is more accurate. As we don our waders for another slog through the sewers of campaign muck, I would like to suggest an alternative strategy. Instead of the inane mudslinging and mind numbing irrelevant dirt digging, how about having the candidates use their very expensive airtime to actually inform us. (For the sake of brevity I will use the grammatically correct masculine pronoun to mean both he and she.) My dream candidate will admit honestly to any skeletons in his closet before his opponents have a chance to discover them. This will show a humble candidate who can admit his mistakes, has the wisdom to learn from them and disarm his opponents in the process. He will be able to defend himself against the criticisms thrown at him by the other candidates with honest and forthright answers. He will use his advertising opportunities to inform us on his views, his record and his solutions to the problems facing our country. He will be truthful about his take on “hot button” issues. He will not try to spin his way out of a controversy, but will explain himself honestly and completely. This dream candidate will absolutely refuse to engage in negative campaigning. No digging up thirty-year-old indiscretions, or irrelevant but inflammatory comments made by an opponent. No taking pieces of an interview out of context. No misquoting or twisting facts. The dream candidate will publicly disavow any private group who campaigns negatively on his behalf. He will go on record, informing all campaign contributors that their support of his campaign will have no influence on his decisions and that his purpose in government is to represent his constituents. I know. I’m dreaming. It will never happen. But it would be nice to see. I hope this really cute video touches you heart the way it did mine. May everyone who reads this post have a blessed Christmas. Now that Time Magazine has made The Protester “The Person of the Year”, I have been giving a lot of thought to the First Amendment Rights to peaceable assembly and to petition the government for a redress of grievances. We hear a lot about our constitutional rights, what we don’t hear a lot about is our responsibilities in exercising those rights. There are many ways to petition our government officials. We can write or email them. We can gather signatures on a petition. We can call them and we can vote. We can even gather in large numbers in a show of unity to call attention to an issue. That is what is meant by the right to peaceably assemble. A peaceful assembly respects the rights of those not participating to go about their daily lives and does not try to impede them by blocking streets, sidewalks, or the entrances to buildings. A peaceful assembly does not destroy public or private property. People do not commit crimes against one another during a peaceful assembly. A peaceful assembly respects the rules of usage for public parks and open spaces. A peaceful assembly respects the rights of others to use public parks and open spaces and does not occupy them for an unreasonable amount of time. When the purpose of a gathering is to call attention to its cause by being willfully disruptive or destructive, when it causes an inconvenience to those not participating by obstructing their access to places were they have a right to be, then the gathering is no longer a peaceful assembly. It is an act of civil disobedience. Civil disobedience is an unlawful act and is not protected under the constitution. To understand the difference between the two acts we need to understand why we have this right. The Constitution was written by men who had a healthy mistrust of government. They wanted to limit the government’s intrusion into our daily lives. 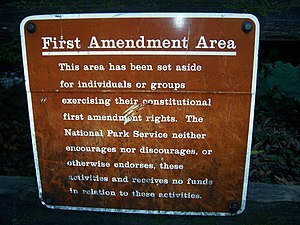 The First Amendment spells out some specific rights that allow us to maintain control of the government and the individuals elected to serve us. Not all countries enjoy this kind of freedom. In places such as China, and Middle Eastern theocracies, the people have no other choice but to engage in civil disobedience in order to confront the injustices their governments force them to endure. But because our constitution gives us lawful and civilized ways to keep our government accountable to us, an act of civil disobedience is not only unnecessary it is counter productive. When a gathering becomes a disruptive nuisance to a community there will inevitable be someone who seeks to remedy the situation and prevent future problems by suggesting regulation. It seems reasonable enough, lets protect the public by restricting, how many may gather for a rally, where they can gather, how long they can gather. Before long political correctness takes over and along with protecting public safety, the government decides that it should protect us from being “offended” as well. Now along with the restrictions already in place comes a restriction on who can gather. Now you have to submit your agenda to code compliance to make sure it does not encourage disruptive behavior. See how this goes? We all have a right to have our grievances heard, but we should also be good neighbors and citizens. The First Amendment was not meant to allow an “anything goes” approach to addressing our concerns. When we abuse our rights, we set in motion the means to erode them. I first heard this on the Neal Boortz show. The video is astonishing in its audacity. It is an embarrassing illustration of everything that is wrong with our system of social services. I’m not a social worker, or a psychologist. I’m just a housewife and mother who’s had to work hard, pay taxes and live with the consequences of my choices. I could never imagine myself proclaiming that someone other than myself or the father of my children should “pay for them.” Yes, children are a gift from God. But when he blesses us with children He tasks the parents with the responsibility for their care. Not the government. It’s obvious that our welfare system is broken. Fortunately most of the problems are simple to fix. Unfortunately our culture of political correctness and preservation of self-esteem will prevent these changes from taking place. We need to remember what the purpose of the welfare system was in the first place. It was meant as a way for people who had hit hard times or who were economically disadvantaged, to be put back on the path to self-sufficiency. No one was expected to stay on welfare for life. It was certainly never intended to be a “family business” handed down from parent to child. As our society began to put a higher value on self-esteem than integrity, the stigma of being on welfare began to disappear. We were taught that feeling guilt and shame regardless of the reason was a bad thing. This caused a fundamental shift in our attitudes, and so we began to feel that not only was it okay to live off of the charity of others, it was our right. Politicians eager to buy votes from the poor and poorly educated were all too willing to promote this attitude. To cover all the minute details involved to fix the system would be too unwieldy to put into one blog post. We can begin however, by making some basic common sense rules for people who are receiving welfare to live by. 1. In order to continue to receive benefits, a person must demonstrate that they are actively trying to get out of the system. 2. When a woman comes into the system, the children she has at the time are covered. If she chooses to have any more children then she and her children are kicked out of the system. 3. Any one guilty of drug possession or of being under the influence of illegal drugs is kicked out of the system. 4. Any one convicted of a crime other than minor traffic violations is kicked out of the system. 5. Any one who uses welfare funds to buy alcohol, tobacco, illegal drugs, or luxury items or services, or uses the funds for gambling (to include lottery tickets) will be kicked out of the system. 6. If an individual or family is living in any form of public housing they will be expected to take care of he property. They will not damage, deface, destroy, or willfully neglect the property or they will be evicted. Those living there who are physically able will be expected to participate in the upkeep and maintenance of the buildings and grounds. Six simple, straightforward, common sense rules. Are they unreasonable? No. Discriminatory? No. Are they a bit harsh? Well maybe, but they need to be in order to change the attitude from a one of entitlement to one of self-sufficiency. Knowing what the rules are and the consequences for breaking them from the outset could be a good incentive to do the right thing. The taxpayers who are funding the service programs have a right to expect responsible behavior from those who are benefitting from the system. By demanding that people in the social services system make an effort to reduce the financial burden placed on the taxpayers for their care, we make them a partner in their care and help to create an attitude of stewardship rather than entitlement.